HOME | ABOUT | WORKSHOPS | PRIVATE LESSONS | CLASSES | CONTACT | FOLLOW US ON FACEBOOK! Click here for course maps and a recap of the 2017 Workshops! Click here for course maps and a recap of the 2016 Workshops! 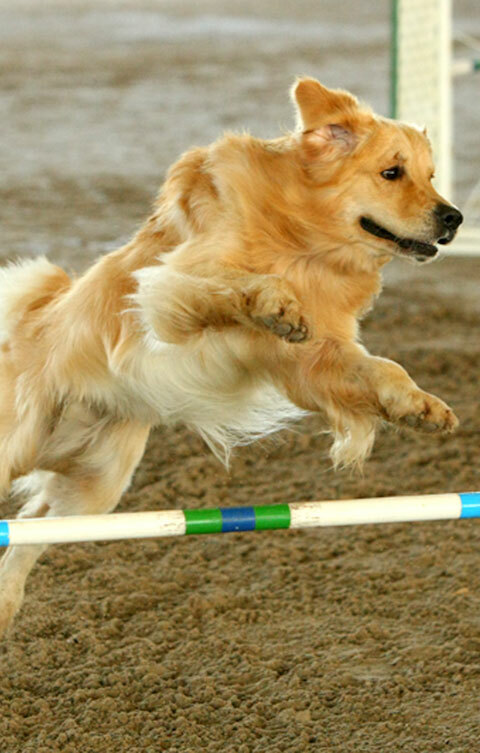 Interested in holding an Agility Workshop at YOUR location? Lisa and her Goldens are good travelers! Lisa can't stress enough how important a good, solid base of foundation skills is to every agility competitor. Through several years of teaching and coaching students of various skill levels, Lisa realized that Linda Mecklenburg's observations in agility's early days are still very true today. Lisa would love to show you how to use the 4 natural cues (motion, shoulders, positioning, eye contact) to easily and seamlessly maneuver your dog through any level of agility course. Apply the Foundation Skills to common sequences and see how well your dog responds. Using the 4 natural cues only, you will run a short sequence and will be amazed at how your dog will focus on YOU! Calling your dog's name or yelling "come!" several times during a run will be things of the past. Lisa can create sequences and coursework to meet and challenge any skill level. Participants can walk/run the sequences and suggestions will be made on an individual basis to help each dog/handler team maneuver to the best of their abilities. Are you sure your dog understands all of your commands - even for the most basic of behaviors? Lisa's Obedience "With a Twist" will engage both you and your dog through many exercises that you will not likely find in most obedience classes. The exercises she presents will test you and your dog's skills to perform with multiple distractions in a fun environment. While many of the skills are obedience related, they are designed to help the agility team on course and beyond! Yes! Your dog CAN perform the weaves quickly, reliably and with distractions! The theme of this workshop will continue the discovery of how our motion and position can affect our dog's performance. Be ready to help your dog deal with distractions and some more difficult entries. This workshop is for dogs who are proficient in the weaves and can do them with speed and confidence. For this workshop, we will concentrate how to help your dog with smooth, safe approaches and exits from the contact equipment. Just how independent are your dog's contacts? Can you handle from a distance - even just a little? We will work on several common sequences, including turn back to and from tunnels, turning off the equipment and building confidence in all contact performances. While we can't totally recreate a trial environment on the training field, we CAN try to recreate many of the distractions that our dogs are facing at a trial and in the ring. For this workshop, we will add as many distractions as your dog can handle. We will start slowly and as your dog accepts the challenge and is rewarded for ignoring anything pesky, we will add more as the session progresses. Our goal is to give your dog just enough that might at first make him a bit uncomfortable but not so much that he is unable to work through it. If you are interested in hiring Lisa for a seminar of any type/length, please click here to contact Lisa for available dates. Please list location, topics you would like, length of seminar (4 hour, full day, two day) and number of people/dogs who would be attending.